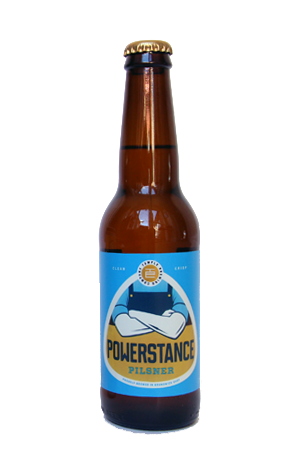 Powerstance Pilsner is a beer conceived through the slightly unusual process of two head brewers on either sides of the planet working through a recipe over the phone. Temple’s then head brewer Glenn Harrison had met the then head brewer at Weihenstephan, Frank Peifer, during a past Good Beer Week and, when Glenn decided he wanted a traditionally minded pilsner, he sought some guidance from Frank. The name is inspired by the manner Glenn uses when addressing an audience: legs apart beyond shoulder width; arms crossed, just like the label image. The beer inside is rather less strident (a bit like the man himself), being a glistening, golden coming together of soft spicy and herbal hops (in the main from Spalt, one of the four European "noble hops") and distinctive German pilsner malts. It's finely judged with everything sitting just right, down to the tight, cleansing bitterness.